It asked asylum seekers how they felt about head coverings. Immigration Minister Ahmed Hussen at Brampton, Ont. 's city hall on Oct. 4, 2017. He condemned an RCMP questionnaire which appeared to target Muslim asylum seekers on Friday. VANCOUVER — Canada's immigration minister is condemning an RCMP questionnaire that appears to target Muslim asylum seekers crossing the border from the United States into Quebec. Speaking in Vancouver on Friday, Ahmed Hussen described the Mounties' interview guide as unacceptable, saying it is incompatible with the government's anti-discrimination policy. Among other things, the document directed applicants to specify their religion and "how often'' they practice it, and asked opinions about head coverings associated with Muslim women and terrorist groups with mainly Muslim members. "That line of questioning is simply not consistent with the way we do things in Canada,'' Hussen said. The questionnaire was used at a Quebec border crossing that saw thousands of asylum seekers enter from the U.S. over the summer. Hussen said he applauded Public Safety Minister Ralph Goodale's decision to put a stop to the practice as soon as he found out about it. A spokesman for Public Safety Canada said Thursday the questionnaire was only used "locally'' and described the questions as inappropriate. Asked about the document, an RCMP spokeswoman said it had been revised and the Mounties would not be granting interviews on the topic. Hussen was in Vancouver to showcase changes to the Citizenship Act that came into effect this week that reduce the residency and language requirements for people applying to become Canadians. As of Wednesday, permanent residents only need to be in Canada for three of the previous five years before they are eligible to apply for citizenship, with no minimum days per year. That compares with the previous law requiring that four of the past six years are spent in Canada, with a minimum of 183 days in each of those four years. The new law also narrows the age at which applicants must meet language and knowledge requirements to anyone between 18 and 54 years of age, compared with the previous span of applicants who are between 14 and 64 years old. Changes to the act also now give credit towards the residency requirement for citizenship even before an applicant becomes a permanent resident. 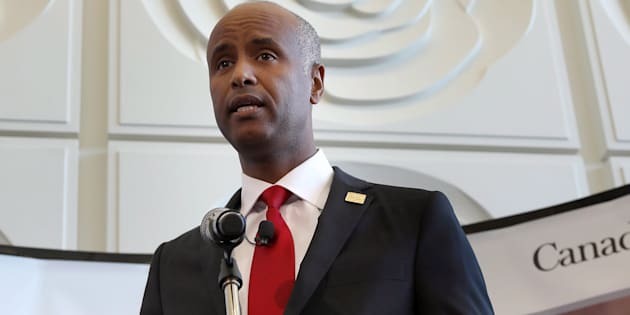 "We hope that these steps will encourage even more permanent residents to meet their citizenship requirements to become Canadians,'' Hussen said. Amendment to the Citizenship Act received royal assent in June but certain provisions were delayed. Further changes are expected in late 2017 and 2018, such as authorizing citizenship officers to seize suspected fraudulent documents and transferring responsibility from the minister to the federal court for making decisions on revoking someone's citizenship in cases of false representation or fraud.